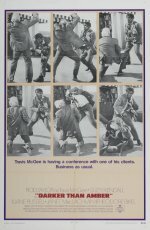 Here's thriller writer John D MacDonald's thick-ear detective Travis McGee in his only cinematic outing, (though a series was mooted) incarnated by likable Rod Taylor, and glossily filmed on exotic Caribbean and Miami locations. On its British release, this film was heavily truncated, but completists beware there never was any more to Jane Russell's role in her last screen appearance to date. Director Robert Clouse proved to have a talent for globetrotting violence, as shown here, fetching up eventually in Hong Kong as director of Bruce Lee's Enter the Dragon, and Jackie Chan and Cynthia Rothrock vehicles. Darker than Amber was Clouse's feature debut.